Starting with our newly released brochure for 2011, Pink Banana Media is coming out with a whole new look for this year! Focusing on the key areas of online media, especially social, and combining that with real world marketing, leveraging smartphone technology, Pink Banana Media is poised for continued success in this new media landscape. 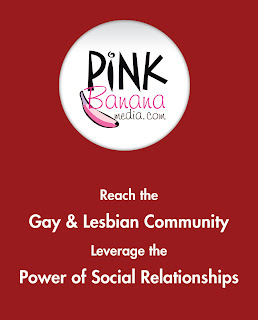 Our new tagline is "Reach the Gay & Lesbian Community - Leverage the Power of Social Relationships". Integrate the power and reach of social media marketing with traditional online strategies including banner ads and e-mail campaigns. Real World, Experiential Marketing Reach gays & lesbians in their daily lives, at restaurants, hotels, gyms, shops, bars or events using smartphone technology. Integrate it with social media to create a true, 360-degree marketing strategy leveraging authentic social relationships.